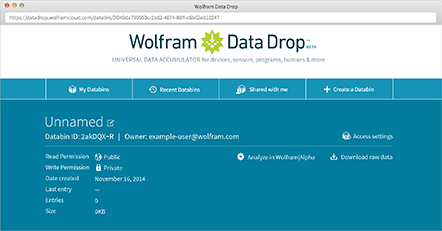 Click on any Wolfram Data Drop page. Note: Creating a databin is free, but you need to sign in with a Wolfram ID. Note: To create a databin, the Wolfram Language needs to have access to the Wolfram Cloud. CreateDatabin[options] lets you specify options of the databin, such as permissions or name. Every databin you create is given a unique UUID.